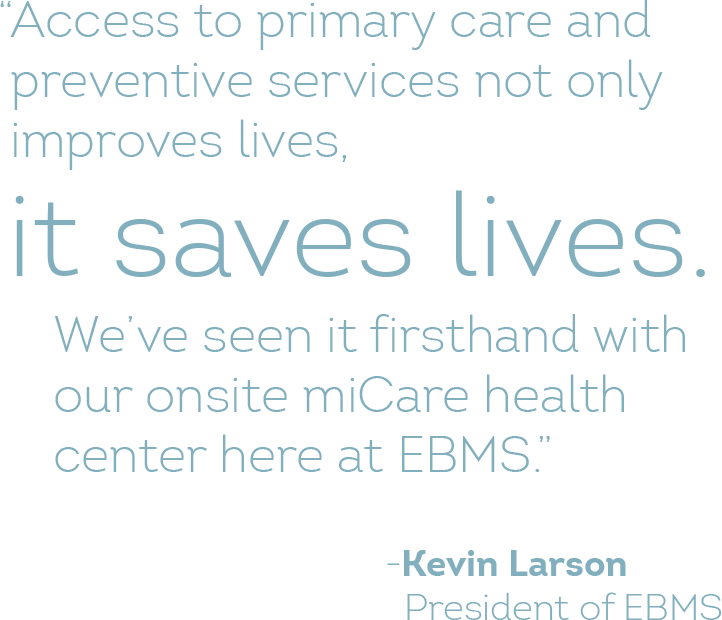 The concept of workplace miCare clinics started in 2006 with the vision of Rick Larson, cofounder of EBMS. At the time, EBMS was a very small employer in Billings, Montana, self-funding its own benefit plan – and the conventional wisdom was that worksite clinics were best suited for companies with 500 or more employees. Before long, data revealed that the small health center was having an impact. Primary care usage was increasing, while overall health spending was decreasing. It was clear that the clinic was removing barriers to and closing gaps in care. Moving forward, the clinic focused on members with chronic conditions, making maintenance drugs available at no or low cost. Then a longtime EBMS client – a company with a staff of only 70 – asked to give its employees access to the EBMS health center, hoping to make a similar impact on health and wellness. This is when the shared-clinic model was born, and it was a key part of the decision to move forward. EBMS began to package the program and market it under a new company, known as miCare. Ready to Write Your Own Story? phone call to get started on your own miCare Health Center.